Pse help... I also attempted to replace with standard 2032 battery. However, after a few hundred Km's it failed. Have not removed the unit again, but I suspect the centrifugal force dislodged the contacts. Where do you get the one pictured? Part number? Most electronic component suppliers stock them. No idea of the part number. If you google "cr2032 solder" and go to Images you will see all the variations. Jughead and Peter_m, thank you. Will Google and see what info I can get. issue: My rear TMPS K1600 2012 is reading 7-8psi low. Actual tire pressure is 40-41psi, TMS reads 32-33psi. I suspect the Rear TPMS is bad. I tried to do the rapid decompression of the rear tire a few times. The Canbus responds as designed with a red triangle and the engine going into "LIMP" mode so I know the computer and TPMS are talking. For some reason the Rear TPMS became un-calibrated. I suspect it is toasted. My BMW dealer said they have issues with many of the TPMS sensors doing this. They told me to try the rapid decompression a few times and that sometimes wakes the TPMS up and calibrates it. A new BMW OEM TPMS is $220usd. Another kidney donation! I read on a previous blog that these new TPMS from China work on most BMW's 2012 to current year but that the battery they come with may be old...thus the new CR2032 battery with wires. You can not solder the lithium battery as they get hot and it ruins them. I do not like the idea of using a holder or just the existing metal prongs with hot glue to hold the battery in place. Regular riding it would be find but once you hit some speed bumps or potholes at 80mph i think the battery would dislodge. I plan to remove the glue in the new Chinese TPMS , TPMS, dig out the old battery and solder in new batteries using the wires directly to the terminals. The next battery change in 3-5 years would be a really fast operation. Since the CR2032 has a wire I will just epoxy the new battery an inch away from the new TPMS. During a future changeout I just break the glue and put in a new battery with epoxy...should take about 5 minutes each. i did the soldering on the battery and it is working fine already 2 years now. bad reading can be caused by battery also. just change it bro and all be fine. good luck. Make sure that the TPM sensor you order from China operates at the correct frequency. It needs to be one that communicates at 433MHz. BALVIAMBE, Thanks for the bad battery tip. I was going to try that first, The EL-50448 is suppose to be able to test the battery remotely. I will try that out today. The Chinese TPMS for $25 is suppose to be 433mhz. tpms should be 433 mhz that is it change battery bro all will work fine. Awe found it. The TPMS Battery is actually a CR2050HR. 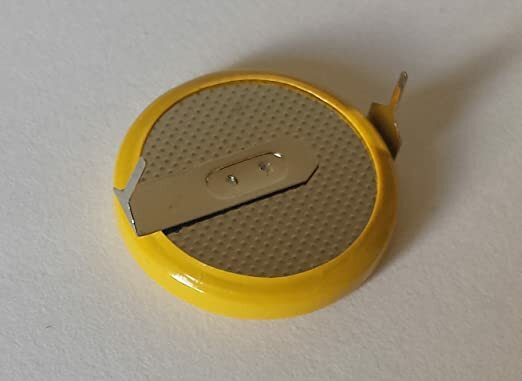 Ebay: https://www.ebay.com/itm/4-PCS-Maxell-CR2050HR-Lithium-Buttom-Battery-3V-Coin-Cell-Tab-welded/182085577865?epid=1065216573&hash=item2a65256c89:g:HAAAAOSwJQdXCAC-:rk:2:pf:0. About $5 each. The CR2030 will work but maybe not for many years. So a difference is 1.8mm, which is not that much difference, as there is in that respect "plenty room" within the BMW TPM Sensor to mount them. The CR2032HR ia 200mAh, whilst the CR2050HR is 350mAh. Bottom-line: the CR2050HR should a fine replacement (too) for a dead battery and probably will last a bit longer versus the CR2032HR. Getting a slight difference in reading the actual pressure often comes down to what tool you are using as a reference to compare the measurements with. El cheapo tyre-pressure readers often give very slanted results. Whilst investment in a good digital or analoge reader often give more accurate results. TPM sensors, including BMW's, are so-called temperature-compensated. Meaning, the pressure displayed on your dashboard is the pressure as if the tire is at 20 degrees Celsius. Which a tire seldom is, hence also the reason the pressure does increase when the tyre does get warm. Therefore you should always measure the pressure before riding and preferably pressurise your tyres a wee bit above but never below the desired pressure. Where it really comes down to your personal preferences, and your brand of current tyres, but not excluding what the motorcycle manufacturer states in the user manual about tyre-pressures. I like harder tyres as the bikes rolls & corners better for me, compared to what BMW dictates in my user manual.